Oil and gas filters have been changed, decks have been power washed and the boat is now in the barn for the winter. It has been a great season on the lake. It started out great and the fish stuck around for almost all summer. The size of the fish was good with most fish in the 4 to 6 pound range. Another thing, they have been full of smelt. There should be a good run of smelt next spring. Keep your stick on the ice and have a good winter. Marge and I took a ride out past the green can to burn a some of the gas out of the tank. Of course we had to set lines and we set up in 95 feet of water. It wasn't long and a fish tripped the down rigger. It didn't stick. While I was reeling in the lure a fish hit the lure right at the surface. I don't know what it was but it sure gave me a battle for a few seconds. We lost another one right behind the boat, then we had a boat stopper on and that one pulled off. We pulled lines and headed in for a meeting. This is the last trip for the Kala Moiakka for this year. The Kala Moiakka is ready to put to bed for the winter so Bruce called and asked if I wanted to fish from the Roamer. I said "sure" and met him and Jimmy for a 9:00 departure from his dock. The seas were showing a 1 to 2 foot swells from the SE. It took a half an hour to get to the fishing spot and the lines went down. It didn't take long and a fish was on. We landed that fish and I put the line back down, it was down about three seconds and tripped, fish on. We had found the fish and it was hard to keep the lines in the water. The box was full to capacity before noon so we picked lines and headed back to port with 13 fish in the box. Most fish were in the 6 to 8 pound catagory. 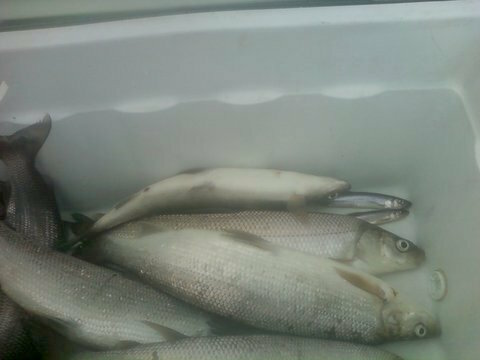 John has been jigging up some nice whitefish from Lake Superior. He had his jigging rods with him and wanted to see if we could find some whitefish. The anchor went down and down went the jigs, no bites. Soon the wind came up and the boat couldn't hold anchor so we pulled anchor and did some trolling. The fish were not hitting very good but we did manage two trout and lost four. There were also a couple of knockoffs. Is it because the fish are full of smelt or are they just cold? At least John and Robin have some fresh trout to take home. The wind blew all night but it was an off shore wind so we fired up the Kala Moiakka and headed out into the bay with our friends John and Robin. We had to stay in Bete Grise Bay and fish the 50 to 80 foot area. We marked lots of bait and quite a few fish. None of the fish hit. After a few bait changes we gave up and headed back in with no fish and no hits. The water temperature had dropped from 68 degrees to 55 degrees. The fish must have been shivering instead of feeding. A fellow hockey player, John and his wife Scarlet, were vacationing in the Keweenaw. We set up a fishing trip while they were up here. Emil came along to catch a few trout too. It blew a strong Easterly all day Sunday kicking up some 4 footers and they were still rolling in on Monday. Tuesday looked better so we left the dock at 0830. The new impeller was working well in the port engine and the engine temp held at 150 degrees. All looked well so the Kala Moiakka was throttled up and we motored out to the fishing grounds. Lines went down and we fished 90 to 140 feet. It didn't take long and the lines started tripping. A couple of the trout were boat stoppers. They were in the 10 to 12 pound range. We ended up with 2 pinks, 2 coho, and 11 trout. Emil will be able to eat fresh trout and our guests, John and Scarlet, will be able to take some fresh trout down to the Eagle River Wisconsin area. There seems to be a lot of smelt around as one trout had 40 smelt in its stomac. The crew was Steve, Bruce, Gene, and me. Calm waters as the Kala Moiakka cleared the channel. It is a rare occurrence this time of year. We took advantage of the flat water and scooted out to off shore waters. We set two suspended lines and sent the other two down to the bottom. It wasn't long and a salmon hit one of the suspended lines at 50 feet. It got off. Then a deep pole was acting strangely so we tripped it and a small pink came into the boat. Steve who has a place in Alaska said "That isn't even a fish. 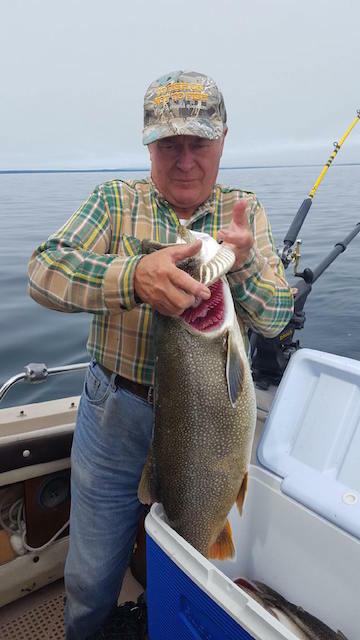 I came up to Lake Superior to catch lake trout." Well things soon changed as we found the trout in 85 to 110 foot of water. Most trout were in the 5 to 6 pound class with an occasional 8 pounder thrown in. We quit with 19 in the box and went exploring for some off shore reefs. On the way in the port engine was heating up so it looks like I will have to replace the water pump. It's a good thing I have a spare aboard. The crew today was Ned, Hannah, Jerry, and Bruce as a deck hand. The lake was like glass so we headed out for distant waters. Lines went in at 140 feet and a salmon hit the line that was down 100. It jumped and threw the hook. We started to catch trout at 120 to 110 feet. We were busy hooking and landing trout. We did loose a few fish while the rookies were learning how to gently bring a fish to the boat. Then the fish quit hitting. I had to pull the, wash the lures off with dish soap, trick out of the bag. The washed lures went back down and a fish hit in less then a minute, a coincidence? I don't know but it worked. We caught 12 when we quit at 12:30. Fish on the grill tonight. spots that were hot last year. We trolled from 100 feet to 165 feet and never marked a fish or had a hit. There were some rock piles a little way away so we trolled over there. As soon as we got into the rock piles the action picked up. There were suspended fish at 60 feet and marks on the bottom. We had three lines tripped at once. Two of the trout were landed. After a couple passes we quit with 9 trout. We need Whitefish Willy to show us where the whitefish are. Scott, Kelley, Steve, and Debbie, first mate Marge. started in the bay and caught one salmon. Ran out of the bay and set lines, we caught seven lake trout. We quit when Debbie was turning a little green in the two foot rollers. The sea was not the one foot rollers that Bruce had reported. Gene wanted to try jigging. We rigged up the short rods with 10 pound test leader and a couple of small jigs. The anchor went down in 75 feet of water. We fished there about a half an hour with no luck. A couple of moves later found us in shallower water with lots of bait fish showing up on the graph. We did manage to catch three smelt. Then I had a hit and up came a coho. A little while another one hit the jig. That one was netted and Gene had one on. The crazy salmon would swim to the surface and jump two feet out of the water, then circle the boat. It was exciting. We landed three of them and two of the three broke the line when they were thrashing around in the net. 10 pound test isn't strong enough for them. There must be whitefish out there somewhere but we haven't found them yet. Fished with Ed, we were going to go bobbing but it was too rough. We washed the deck all the way out to Smiths Fisheries and trolled back from there. Wind was NE and swells were coming in from the East. We washed the deck on the way out. Caught one trout and one salmon on way back. No jigging today. Nice and calm, tried jigging in the schools of stuff in 65 feet, no luck. Then moved to 75, no luck. Finally I set up in 92 feet. I caught three nice lakers, all on the whitefish jigs. A strong current running even without wind. 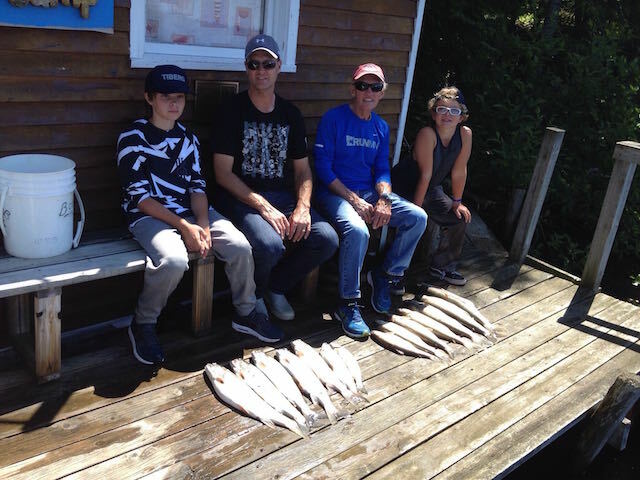 A classmate of mine, Ray Tyberg, his son in law, Kevin, and grandkids, Finn and Ethin wanted to go fishing. The boat left the dock at 8:30 and we ran out to 80 feet to set lines. Nothing showed up on the depth finder but we did manage to catch a couple of small trout. It looked pretty bleak so the lines came up and we moved. Our second spot was not any better. Another move and we found fish. We trolled one pass up the drop off and one trip back. This kept the kids busy hauling fish. We quit at 1:00 with 14 fish in the cooler and a couple of tired kids. Maybe they do bite in the afternoon. My cousin Ron is coming up to his place in Helltown so I had to run up and start his gas refrigerator. It took me most of the morning to get things done up at Helltown. Gene and Emil came down and we took Gene's boat out at 12:30. Emil kept saying, the fish don't bite in the afternoon. We set up in 80 feet and put our favorite lure down. Emil caught a fish in 5 minutes. We worked the 80 to 100 foot depths and the fish were hitting pretty steady. A few lure changes and we had a nice bunch of trout in the box. Genes wife Jan wanted a salmon so we switched areas and set the lines down 30 and 40 feet. It didn't take long and a line tripped with a nice coho on the end. We landed it and then hit a slow spot.. We trolled back twords the channel and ended up with two more trout. Our total for the trip was 9 trout and 1 salmon. Too bad the fish don't bite in the afternoon. It was a nice day so I decided to take the boat out and try jigging for whitefish. I dropped the anchor in 68 feet and tried jigging. There were some marks on the fish finder so there was hope. I put my line to the bottom and had a light hit, it didn't stick. A few minutes later I had another hit and up came an eight inch smelt. A few minutes later I caught another smelt, then one that was so small my lure was bigger then the smelt. I ended up with 4 smelt. I had a larger fish on for a little while, It fought like a whitefish but we will never know if it was a whitefish or a trout. I had a heavy hit and had fun landing a 4 pound coho. He gave me quite the battle on my short jigging rod. More gravlax in the future. Wrong bait, hook to small? Emil, Burce, Paul and I headed out to pull some abandoned gill nets. There were two that we really wanted to get out of our fishing holes. These nets are dangerous, three people got there anchor caught in one in Keweenaw Bay and it pulled their boat under and they drowned. One was a nine year old boy. We find a couple every year and we keep track of where they are and call them into the Great Lakes Indian Fish and Wildlife Comission. If they have tried to remove them without sucess, we will drag them into the shallows, mark them with buoys and then they will come and remove them from the lake. I had a new rope that I bought for this project but it floats but the grapple we had wasn't heavy enough to hold bottom and we couldn't hook the net. We took 5 passes over the first net that was in 204 foot of water. Then we gave up on that net and tried for one in 150 feet. We couldn't hook that one either. Around noon the crew decided that fishing was more fun then trying to hook the net so we set lines and trolled. In two hours we pulled 8 trout out of the 150 foot depth. We quit at two and headed back in. We will be back with heavier grapple hooks weighted down with chain. That should allow us to hook onto the abandoned net and pull them into the shallows so they can be removed from the Lake. Bruce called and said he was heading out. Emil and I joined him. The bay was calm when we cleared the breakwall. There was just slight swells coming from the south. After we cleared the green can it turned into a different lake, swells from the SE and a chop from the SW made for a very confused sea. It wasn't too bad in the shallows so we set lines in 80 feet. The fish were there on Tuesday. Well they were gone. This year it has been, here today, gone tomorrow. 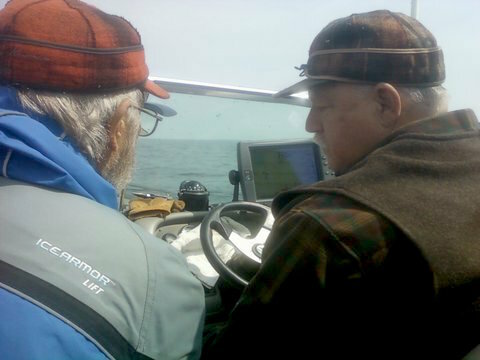 We fished 80 foot, 90 foot, 100 foot and worked out to 150 foot with very few fish showing on the fish finder. We did manage to catch one off the bottom and one suspended one at 60 feet. A rain shower came over the Keweenaw Peninnsula and made visibility poor. Bruce looked out the side window and saw one of the buoys from the trap net right along side of us. Emil and I had to do the "net drill" to avoid getting caught in the net. After and little more looking for fish we did manage two more fish. One came up as we were pulling lines and we lost that one at the net. Our total for the day was 4 fish. Not good for three EXPERT fishermen like us. I was still in my robe when Gene came over to do some work on his boat. I had work to do on my boat too. After a cup of coffee and some BS we both went down to work on our boats. I had a battery charger that didn't seem to work. After checking things out with a volt meter we concluded that it was the battery switch that was the culprit. After cycling it a few times it seemed to work properly. 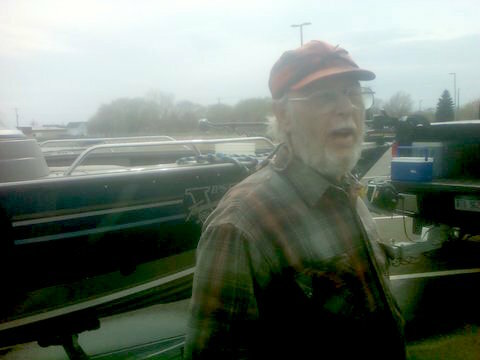 Gene had some things to check out on his boat and he asked if we should check them out while we trolled. I said, "why not". It was after 11 when we headed out. We had caught some trout in 90 feet last week so we went out there. Lines went in at 80 feet and we had a fish right away. 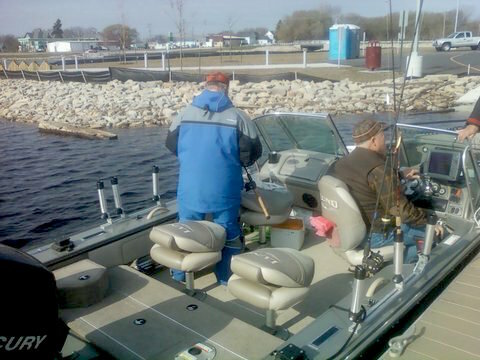 Since we only had two lined down it was pollible to turn the boat and head right back as soon as the fish was landed. We fished two humps with fish on both humps. Gene only wanted a couple of fish to take back south so we pulled lines with 4 fish in the box. It was a nice day with about 6 inch seas so we decided to check the bay for fish. We trolled all the way back to the channel and picked up two more trout in 55 feet of water. 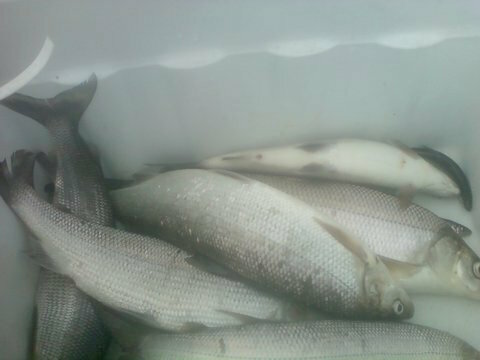 The bay is full of bait fish so the fishing right off the beach should be good for a couple of weeks. It was foggy in the morning. I could not see across the bay and see Bruce's boat. I walked the dog and started to do chores arond the camp. About 10:00 I could see the fog lifiting and the lake was calm. 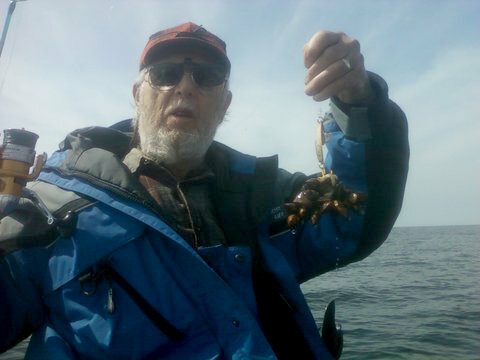 Bruce had really found the fish on Sunday and even caught a 20 pounder. Ed wanted to go out so I called him, he was up town and said that he would call when they were back at the lake. Bruce said that he would go and show us where the fish were. The trip down Lac La Belle was not bad as the fog had lifted. However, when we got to the end of the channel I started the radar spinning as the visibility was about 100 feet. I let the auto pilot drive, Bruce kept watch out the window, I watched the radar and GPS. We set lines in 135 feet and hit a couple of hunps that came up to 114 feet. Bruce kept saying "they were right here yesterday". We made three loops across the humps and the fish were gone. They sure don't stick around this year, here today, gone tomorrow. We pulled lines and headed out to another spot. The finder showed some nice hooks in 90 to 110 feet. Lines went down but they would not hit. Our usual deadly lures were down but I reluctanly decided to change them out, one at a time. Still no luck so I drug out a trick I learned from Doug who ran the Lucky Strike Charters. I took the lures that we know produce fish and washed them in dish soap. Then they went back on the lines and started to catch fish. Did washing them make the difference or did the fish start bitting. I'll never know and really don't care as we ended the day with 13 nice trout. Ed has a sore arm as we had him haul in most of the fish. Bruce called and asked if I wanted to go fishing. Of course said, what time? We headed out with a strong NE wind blowing. When we cleared the channel there were 2 foot swells with a 2 foot chop on top of them. It was slow going so we went over to the North shore where we could make better time in the rough seas. We set up in 60 feet and trolled over a drop off to 120 feet. We marked nothing. The place that Bruce and Emil caught all their fish was about 2 miles away so we trolled to where we could make a down wind run to the magic spot. Well the storms last night must have scattered the fish. They were GONE! We tried a shallow 119 foot reef and nothing there either. After we crossed the reef and got to 135 foot we finally started marking some fish. It didn't take long and fish started to come over the side. The biggest problem we had was that with the strong wind you couldn't get back to where you had marked fish. We put up with the wind and waves for another hour and then called it quits with 5 keepers and one throw back. Bruce kept saying, "you should have been here Monday". I have heard the "you should have been here last week" story many tinmes and many times it holds true. Bruce and I just got back from Alaska, see FISHING WITH STEVE IN ALASKA, and the family arrived. We have 13 extra people at the fishcamp. We loaded up six in the Kala Moiakka and headed out trolling. I had no idea where to fish so I went to where we caught fish last year. You guessed it, you can't catch last years fish. I tried a few close in places, then I trolled out to 180 feet. We did manage to get two trout off the bottom and one suspended at 80 feet. It didn't look good. The lines came in and off we went to a reef that was about 100 foot deep. The fish fider showed fish before we even got set up for trolling, this looked better. It didn't take long and we had everyone hauling in fish. We picked up 10 in two hours, all in 95 to 110 feet and right on the bottom. It turned from a slow day on the lake to a very busy day on the lake. Nobody chummed and everybody got to haul in a fish. Marge and I were going to go town but Bruce called and told here to tell me that I should fish tomorrow, we could go shopping on Saturday. That sounded good to me so I called Bruce back and we were set to go at 8:30. Emil was to join us too. We took Burce's boat on this trip and out we went. The seas were not bad, about one footers from the nort east with an ocasional white cap. The skies were clear and blue. There were two other dots on the horizon so we were not the only fishermen on the big pond. Bruce took the Roamer out to one of our usual bobbing holes. We tried to anchor in 200 feet but as usual, the wind, waves, and current had different ideas. when everything settled down we were in 190 feet. It didn't take long and Emil caught the first fish, Bruce the second, and I caught the third. The boat shifted on the anchor and the depth changed to 180 feet, we were on the side of the reef and out of the fish. We pulled the anchor and moved out to deeper water. A few more fish came up but the bite slowed, up came the anchor and we moved again, this time to a spot that I knew. The seas had calmed so we drifted. We caught fish after fish and the guys asked, "why didn't you take us out here first". I said that I didn't want to reveal all my secrets. Then I put on a secret lure and was almost able to catch more fish then the two guys with their geppus. Bruce wants one of my secret lures but he doesn't know the real name or where to get them. The fish were counted and Bruce fired up the Roamer and we headed for shore with 15 fish in the box. Bruce had a little trouble today. A fish pulled his Geppu out of his hand. He recovered it about a half an hour later but it will require a little repair. Bruce had a full crew. He said the weather was going to be nice and he was heading out on Friday. As it turned out the day dawned and Lac La Belle was flat calm. The Kaka Moiakka was sitting restlessly at the dock just waiting to head out to the big pond. I had talked to Jim the day before and he said he was up to a trip. I called him and he said he would be right over. We cleared the channel onto a calm sea. It was slick calm with a four inch swell from the south east. Bruce was already out there and we set up to his south. He had three in the box already. The first drift didn't produce much so we reset and tried another drift. Jim was new to bobbing and he had the first hit. His reel wasn't set up right and the fish got slack and was gone. He had another one on that got off on the way to the surface. 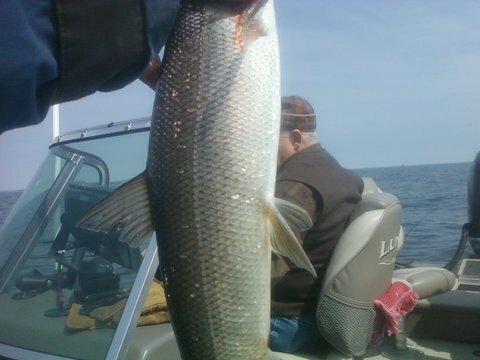 He figured out the drag and the next fish made it to the net, a nice 5 pound lean lake trout. In the mean time I couldn't get a hit. Then I lost three in a row so rather then sharpen my hook I changed lures. We had lots of action as long as the boat stayed over 200 feet. When the drift took us to 195 the action stopped. It was just the opposite of the other trip where the fish were in 185 to 192. We quit with 10 in the box and headed for home. Funny thing though, after the fish were cleaned, there were only nine heads in the bucket. Either the captain can't count or one fish jumped out of the cooler on the way back to the dock. We had too many fish so we decided to stay in camp and drink Bloody Mary's. It did clear up for a while and the topic of splake fishing came up, then the sky turned dark so we never did leave the dock. Willy and Dave tried for white fish but the water flow from the rivers was so low that the fish were not in. I don't think we will ever have a better weekend. After a good breakfast Emil and Bruce showed up. Bruce would not eat any tainted bacon that Dave offered him. We headed out into calm but foggy seas. A different spot was our destination.The captain forgot his iPad at camp so finding the spot was challanging. The plan was to bob again and with the calm seas no anchor was needed. The fish were there and we all started to catch fish. There were a number of doubles and at one time we had four fish hooked on our boat, we landed three of them. About 11:00 we all checked our fish boxes and decided to throw fish back. We pulled the plug at 11:30 and headed back in. Ours was a slow ride in as there was a warbler on our boat. The little bird was lost in the fog and had been flying between the boats. At one time it landed on Ernies rod and while he was holding his rod still a fish hit and Ernie had to disturb the bird and land his fish. The bird stayed on the boat while eating flies until the boat entered the channel. Emil removed the curse of the geppu by landing 8 trout in a row just before we left. We had some dock repair when we got back in. Willy had bypassed the switch that prevents the boat from starting while in gear. When he started his boat for the trip out he was still tied to the dock. The motor started with the boat in reverse and they tried to rip the dock from its mooring. The damage wasn't to bad as Dave, Joe, Ernie, Fred and Bob had it repaired in a couple of hours. The total for this day was 25 in the box and 15 thrown back for a total of 40. That makes 87 fish for the weekend. I don't think we will beat that for many years. It was calm out there, no anchor needed. Joe just waking up after a long ride out. There were three boats today, Bruce's boat the Roamer, Willy's boat the Geppu, and the Kala Moiakka. We all set up close to each other and fish started hitting. Willy and Dave soon erased the skunk smell from their boat and they caught the most fish in a short time. Bruce on the Roamer was having trouble catching fish. Dave had given Bruce a "tainted sausage". He said that it was treated with a special sauce that would repel fish. Ernie caught more fish then Bruce and that was a very unusual event. The fish kept hitting and we all filled our fish boxes. The total for the day was 40 trout in the box. We all retired to the camp for some blody mary's and a nice salad. Here is a picture of our salad bar. After some liquid refreshments, the discussion went on to important things like singing sand on the beach, the truth stick and building an out door oven to bake bread. Willy is building one and needs to know where he can get Quick Lime. If anyone has some limestone and a kiln, let Willy know. He will manufacture some Quick Lime to hold his oven together. The crew arrived at fish camp and we put the dock in around noon. It went in without incident this year. Last year we dropped a drill in the lake and it is still there. After the boat was launched, we gathered around the picknic table and decided that fishing was more important then supper so off we went. Willy and Dave were in Willy's boat and we were in the Kala Moiakka. The destination was a spot that we caught fish last year. The methode for this time of year is bobbing. The Kala Moiakka was anchored but Willy and Dave drifted. It wasn't long and Joe caught the first fish, (as usual). Our boat caught 7 trout while Willy and Dave had the big skunk. That doesn't happen very often. At least we know that there are trout out there. Steve and I met Willy and Dave at the boat launch. This was our first boat trip out into Green Bay. We were heading out into deep water to look for the elusive whitefish. The launch went well and we were heading slowly down the channel when the question was asked, did you put the plug in the boat? That led to a lively discussion about maybe it was in. Willy said that he saw it in and we didn't take on water so out into the bay we went. The anchor went down in the same spot that Steve and I fished last year and just like last year, Steve caught the first fish. Then Willy went to work and caught the second fish. Dave and I were not able to hook them. We did catch some gobies and even a couple of smelt came on board. 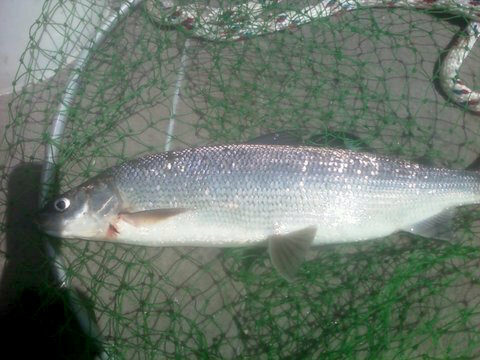 We ended up the day with 7 whitefish, 5 gobies and 2 smelt. Not bad for the first fishing trip of the year. There was a smelt run this year. The smelt ran heavy, 3 dips to fill a bucket. The Little Gratiot and the Tobacco had good runs.